Kathleen McClure is an ex-actor, ex-fight choreographer, ex-HR drone with a deep and abiding love for escapist fiction. Her first novel, Soldier of Fortune: A Gideon Quinn Adventure, embraces that love and begins The Fortune Chronicles, a series of adult adventures for the young at heart (but the young like them, too). 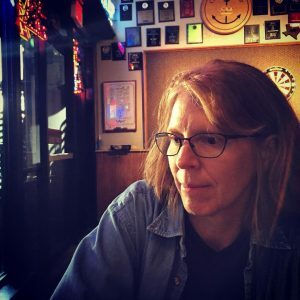 She has also contributed to Diner Stories: Off the Menu (with K. Ceres Wright), Timeless Tales E-zine(with Kelley McClure) and Lorelei Signals Magazine. Kathleen received her Bachelor of Arts in Theatre from UC Irvine before completing the acting program at Circle in the Square Theatre in New York City. She now lives with her husband and two children in Austin, TX. My kids, other writers, all things Hamilton (makes me write like I’m running out of time), movies and television, driving the car, closing my eyes — really, I’m almost never not inspired to write. Possibly it’s the ex-actor thing but I love living multiple lives. I follow the writing into the dark method for the most part. Every so often I sketch out a scene or a thread of action if it’s too complicated, but half the time once I’m in it, things take off in a different direction than I’d planned. Characters for me evolve as I write them. I know folks who can plan every detail and have the best time with it, but for me to be able to do the work, I need to feel I’m growing the person, the story, the world as I go. Oh, my yes, but it gets a bit deeper because, again, the acting thing. I start walking and talking like the character I’ve been writing the most that day. I went Indie, building a company and going for slow, self-guided growth. It’s not a light undertaking, but I have the freedom to pursue the stories I enjoy, and gives me time to find like-minded readers. It also allows me control of my own property, which is very important to me. I think it’s in flux, and likely to remain that way for some time. Then again, the only true constant is change, so those who wish success — whatever success means to each individual — mostly need to keep on keeping on.